The Forex Trading niche is huge. People are always looking for ways to make money and Forex Trading is a popular way to do so. There are a number of Forex software programs available that you can promote and earn great commissions on. These articles can be used on your own blog or website or can be rewritten and then submitted to article directories. If you are in the Forex niche then these are the articles you need for your business. These articles range between 400 and 700 words each. 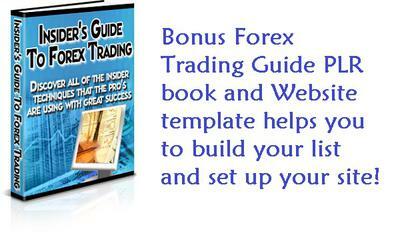 In this pack you will also get a bonus Forex Trading Guide PLR book and a website template!